We want to cater to YOU. Browse the list of offers and packages we have to choose from. Dreaming up something that’s not listed? Shoot us an email or call and we’ll create the perfect package for you. Treat yourself a spa day at our favorite local spa. Enjoy the weekend with a little r&r. This offer includes a two night stay at the cottage and two 50-minute massages. Whether you’re planning a girls weekend or romantic getaway call or email to book today. A honeymoon celebration, or just getting away from “the real world” for a romantic getaway is what we’re here to offer. Celebrate your special birthday, anniversary, engagement, mini-moon or any special time at our lakefront cottage. This package includes two night accommodations, champagne, a dozen roses and a gift certificate to one of Hot Springs’ finest dining spots. Guys, let us make sure your special weekend is done right! Hit the links and enjoy a relaxing weekend on the lush greens. 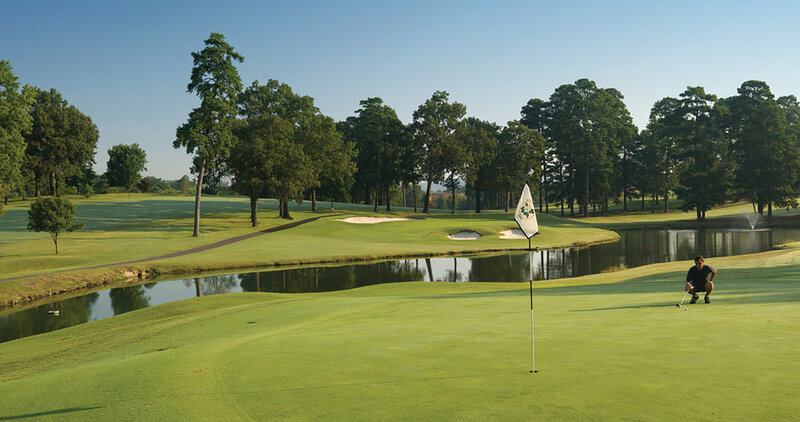 The Hot Springs Country Club offers two different courses for guests to choose from. Guests will have a two night stay at the Farmhouse. This package includes accommodations, two days of golf for four and cart rentals. Call or email to book your tee time! Pine Hill is located on Lake Hamilton but is also surrounded by three other lakes. Ouachita, Catherine & DeGray you choose where you want to reel them in. What better way to do that than a local fishing guide? This offer includes a two night stay at the Cottage and a pro fishing guide for two.